How many people does it take to build a wind turbine? I don’t know the answer, but I imagine it’s quite a lot. If I’ve learnt anything from our wind turbines workshop, it’s that these renewable rotators are considerably more complicated than they look. In this workshop we design and build a turbine powerful enough to lift a small mass up to bench height. We are able to calculate the work done and the power output of our turbines using some simple physics equations. We then discuss the many different variables that need to be taken into account when designing a wind turbine and the types of people who contribute to that process. Even with these smaller versions we have to think about materials, mass, stability, vibrations, torque, aerodynamics, safety, power output, efficiency, strength, balance, design, testing, and who knows what else. And we do all of that in just an hour! 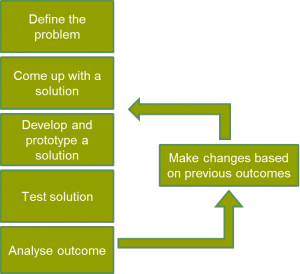 The aim of our workshop is to get into the mind of an engineer, especially the iterative process of “design – prototype – test – evaluate – repeat”. The upshot is that to create a wind turbine from scratch takes hundreds of people, each with a different skill or specialism. The video below shows an offshore wind turbine being put up – just imagine how many people would be involved with such a huge effort, and’t that’s not including all the people who design, test and construct the separate parts. Or the team manager, the IT specialists, the business managers, the customer services staff, the human resources departments, the environmental impact assessors, the health and safety officers, the accountants, the marketers, the research teams, the public relations people, and no doubt countless other people. Siemens employ over 14,000 people in the UK, with several sites in the North East. There are many different routes into working for them, from apprenticeships to degree level positions. Have a look at our employers page to find out more about Siemens and have a go with this 360 degree tour of one of their offshore wind farms.